In ENTANGLED, Carla Rowling has been given her dream of attending cosmetology school. The gift is so generous she feels unworthy because of choices she made as a teen. The pressure mounts as Carla juggles school, is a single mom, helps her best friend Jenna plan her wedding, spends time with boyfriend Will Marshall, and deals with the fact that her son’s father is back in their lives. 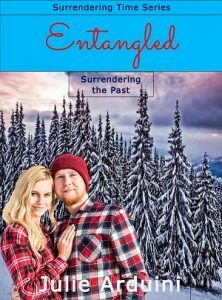 I struggled writing the ending to Entrusted. It went through a lot of revision so my original ending didn't work. I asked friends to pray for an ending and an idea came to mind that not only wrapped up all the loose ends with Entrusted, it gave best friend Carla Rowling her own story. This became Entangled. Most are compilations of people I have met. There are teens in this book, and I spend a lot of time mentoring youth. The teens in ENTANGLED are a blend of them. Carla is a product of my imagination and plotting. Will is mostly imagination but a bit of a compilation.